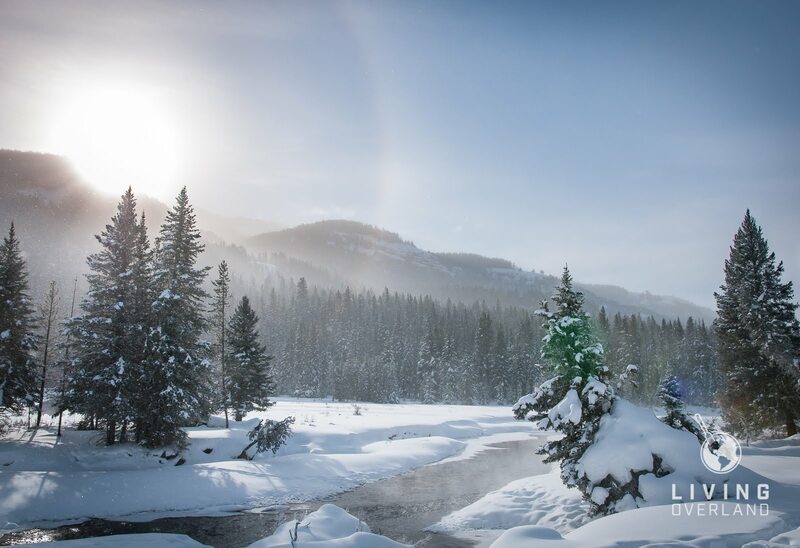 Yellowstone is a fantastic place to visit, at all times of the year, but the winter distills the experience into its essence. 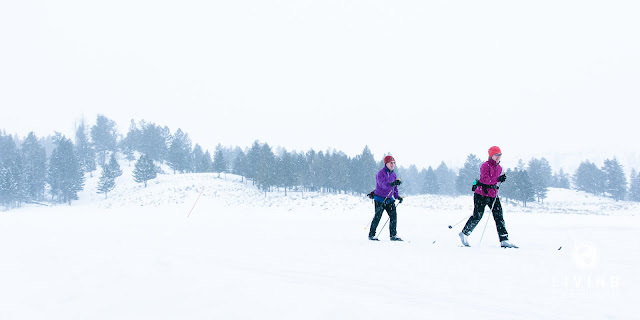 Often brimming with tourist activity during the summer months, Yellowstone takes on a more casual pace during the winter months. Heavy snowfall closes the majority of the park’s interior roads and restricts automotive access to the two northern-most interior roads. Driving through Montana to Mammoth Hot Springs rewards you with unrestricted access to the route from Mammoth to Cooke City, Montana. I get caught up in the hustle and bustle of the park during the summer months and forget to experience Yellowstone. I know it must sound strange, but the slower pace of winter has a massive appeal to me. It allows me to settle in and enjoy being in such a remarkable landscape, which only increases in beauty when the temperatures dip below zero Fahrenheit. You get a sense two forces are competing for the land as you enter the park from Gardiner, Montana. 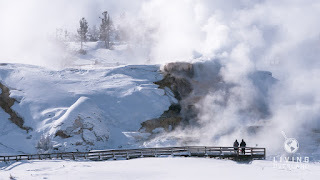 Hot gasses, from thermal vents, along the Gardiner River and at Mammoth, meet the frigid air and form columns of puffy white steam that dance in the breeze. These columns of steam transform into thick blankets of fog, as the temperature drops and the air becomes still. Walking along Mammoth’s elevated path-ways, in these conditions, feels like walks through the clouds. The pathways seemingly disappear into the thick fog and trees come into and out of focus as you travel along the boardwalks. The hiss from the vents only adds to the eerie feel of the hot springs. Winter is also a great time to view wildlife in the park. The lack of tourist traffic affords visitors the opportunity to slow down, take in the landscape, and to be on the lookout for wildlife. The northern roads also offer excellent opportunities for viewing elk, bison, and moose. Both bison and elk love to travel along the plowed roadways and are visible along the entire route. I find most wildlife activity tends to congregate in the Blacktail Deer Plateau and Lamar Valley areas. Heavy snowfall pushes the elk and bison down into the valleys where they find it easier to forage for food. Bighorn sheep can also be found in the park and tend to congregate near the confluence of the Lamar River and Soda Butte Creek, as well as near the Specimen Ridge trailhead. 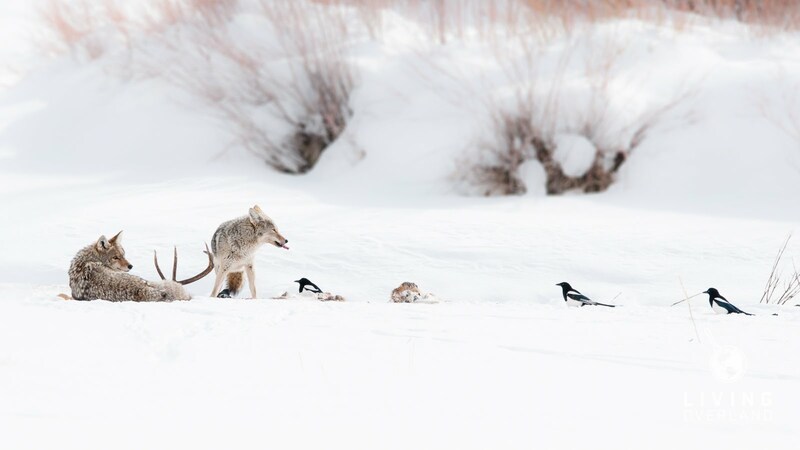 Following their prey, the park’s predators also frequent the pavement, although they prefer to stalk their prey in the deep snow. In the stillness of the morning air, you can hear the howls of wolf packs as they set out on the day’s adventures. Teams of Wolf Watchers can be found, scattered throughout the park, tracking and documenting the movements of packs. While wolf watching is a significant draw for the park, I find the antics of coyotes to be as enjoyable. I find these spunky little hunters to be less shy of my camera, and their antics produce some great memories. Always locked in a battle to protect their food from the beaks of hungry magpies; the coyotes put on quite the show as they chase the scavengers off. Open sections of water along the Lamar, Yellowstone, and Gardiner Rivers provide refuge for several species of birds. 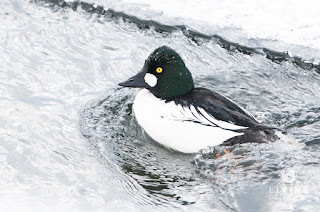 Waterfowl, like the Common Goldeneyes, can frequently be seen flying along the rivers. These birds feed on small aquatic insects found in the open water. The confluence of the Lamar River and Soda Butte Creek is a great place to sit and watch these birds in action. You can also spot American Dipper, another diving bird, in these stretches of open water. Golden and bald eagles can also be seen flying or perched in the trees along the rivers. Occasionally one of these eagles can be seen swooping down to pluck waterfowl from the water’s edge. 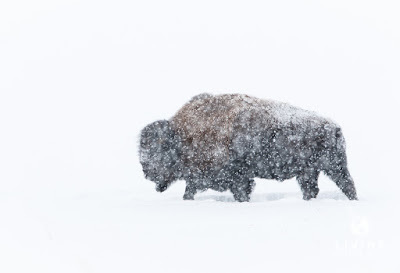 Whether it is the hot springs at Mammoth or the elk and bison in Lamar Valley, life in the Yellowstone National Park is in a constant battle with the elements. Winter weather slows the pace of the park down and makes it a great time of year for watching wildlife or taking a hike around the hot springs. The snow and frigid temperatures transform the park into a magical landscape; there is no better way to describe the experience. 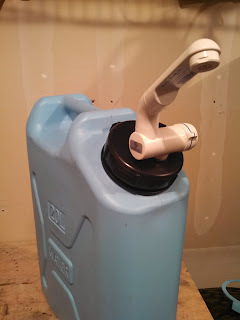 Feeling brave or maybe you have a furnace in your Sportsmobile or Earthroamer? Yellowstone’s Mammoth Hotsprings Campground is open year-round on a first come, first served basis (not that the campground is crowded in winter). 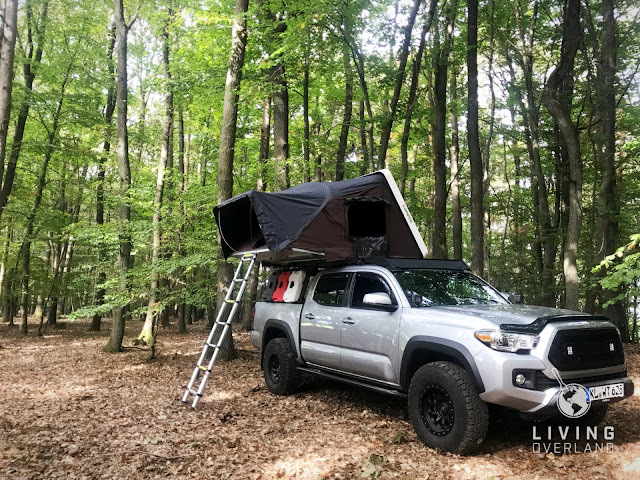 I have spent many a night at this campground, sleeping in the back of our 4Runner, and it makes for a great jumping-off point for daily adventures. Don’t have the gear to brave a night camping in sub-zero conditions? Lucky for you there are plenty of hotels available in both Gardiner (North Entrance) and Cooke City (Northeast Entrance). Book your hotel room in Cooke City early, as the small town sees an influx of weekend visitors, there to enjoy snowmobiling around Beartooth Pass. Unlike visiting Yellowstone in the summer, there are no restaurants or stores open within the park so you will need to purchase your food in Gardiner or Cooke City. These two towns service the park workers, so the grocery stores and a handful of restaurants are still open. I typically pack fixings for breakfast and lunch in the 4Runner and eat dinner at the barbeque restaurant in Gardiner. Are you interested in planning a winter trip to Yellowstone National Park? Check out www.nps.gov/yell for more information on road conditions and lodging. Who knows, maybe we will bump into each other in the park.